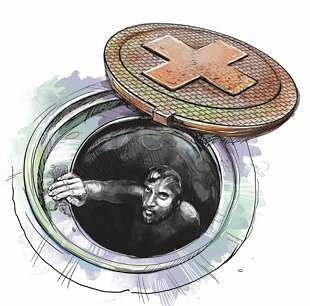 ‘Scourge of Manual Scavengers: A Case of Hyderabad' revealed that approximately 10,000 people are employed to clean manholes and septic tanks. HYDERABAD: While most of us might have forgotten the death of eight manual scavengers in the city within a span of six months in 2016, and departments that hire them deny that a profession like that exists, close to 90,000 are employed, revealed the report, ‘Scourge of Manual Scavengers: A Case of Hyderabad'. The report, currently in its draft stage, after a study conducted by Basti Vikas Manch, an NGO that has been working for the upliftment of the community revealed that approximately 10,000 people are employed to clean manholes and septic tanks. Around 30,000 clean public toilets and those in public buildings like private hotels, another 40,000 to 50,000 people are employed in solid waste management. All the 80 individuals, who were part of the study, shared that it is not only their work conditions that are hazardous, but also the places they live in. While 41 per cent of those working in the Cantonment quarters suffer from skin ailments, 90 per cent working in Valmiki Nagar suffer from the same for working without safety gear. As many as 67 per cent of those in Valmiki Nagar have suffered from malaria and tuberculosis. fever and stomach pain is rampant, especially among manual scavengers, with 86 per cent of them complaining about it. Occupational hazards like alcoholism and domestic violence are common where men drink at least a quarter (190 ml) of alcohol on empty stomach to numb their senses while cleaning human waste. Women said that domestic violence is part of life and men spend the money on alcohol, cigarettes and gutka. People have admitted that they choose to do this work compared to something like a security guard, as it pays three times more for lesser number of work hours. Besides the age old demands of workers that include provision of health cards, better gear and regularising contract employment, they also sought awareness among public about waste disposal.